Does your child know how to solve simple equations, read Roman numerals, and determine the area, perimeter, and volume of geometric figures? 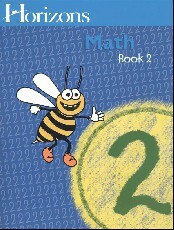 With Horizons 2nd Grade Math Student Book 2, he'll learn that and more! This student workbook contains brightly illustrated lessons 81-160 with 8 review tests. The pages are perforated for easy removal. From Alpha Omega.